Why choose us to sell your boat? 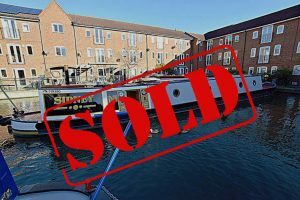 "The whole transaction completed in a stress free and professional manner"
As you know it was Dominic who first valued Egret (and to be honest we thought he'd overpriced it a little, but as he'd successfully sold our previous boat we were happy to go along with his valuation). By the time we'd finished our summer cruising, and were ready to sell, you had just taken over the business. Before meeting you we obviously had to consider whether to sell through Rugby Boats as you were now an unknown quantity to us. Any misgivings we may have had were quickly dispelled on meeting you as you came across as being honest about your experience and enthusiastic about your new business. We must confess to some admiration for you on taking the risk to buy the business. As we handed Egret over we had confidence that you would sell the boat but were prepared for it to take some time as it was then late in the year. When an offer was made we were happy in the way that a negotiated deal was agreed and the whole transaction completed in a stress free and professional manner. Thankyou for a good job. Rugby Boats has earned a reputation for honesty, integrity and care for the customer. Our core values are People Matter, Integrity, Honesty and Customer Satisfaction. 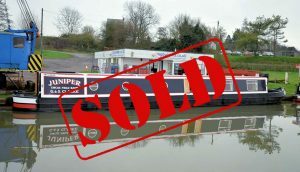 We sell narrowboats which are between mid to high end of the market. We do not sell ‘projects’, and the boats that we sell are ready to go. We are known for this, and take pride in this, and have an extensive list of subscribers to our website who are actively in the market looking for boats. Every time a new listing is put onto the site, each subscriber receives an alert email. Each boat is listed on Apollo Duck and also a video walkthrough placed on our Youtube channel. The feedback we get on our website is that it is market leading, and, generally speaking (there are of course exceptions), turnover of boats is rapid as a result. "To sell within a day was beyond our imagination." Thank you for the excellent service we received from you and your organisation when you sold Juniper for us in December. "Thank you for all your help & advice"
We just wanted to drop you an e-mail to say thank you for all your help & advice you gave us during our purchase of Juniper. It was very kind of you to let us come back for a thorough look & enable us to talk to the previous owner to help us understand the electrics & fit-out. Also, your help with completing the financial transactions & subsequently on the day we picked Juniper up, getting her ready for our collection. "Something we didn't get when looking at other closeby marinas." We will always be so thankful to James & Claire for helping us begin our waterway adventures with such ease. "James and the team couldn't have been more helpful." 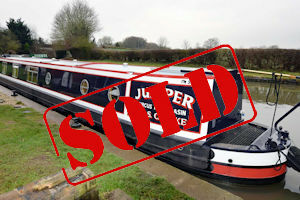 I recently bought my first narrow boat through Rugby Boats. As a novice with a lot of questions, James and the team couldn't have been more helpful. They are very welcoming and go out of their way to help in any way possible. "Very impressed with both the level of honesty and helpful support that has been shown by your company." 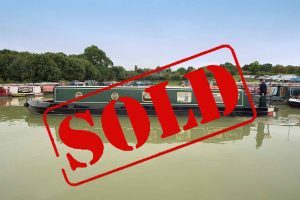 From our point of view, this process has been a complete learning curve, as we have never purchased a boat before or had direct dealings with anyone who has. So far, the level of service received from Rugby Boats, and in particular, from James and Paul, has been exemplary. We had serious misgivings that the whole process would be akin to purchasing a replacement car or buying a house and were very concerned that the "dodgy dealer" aspect might be as prevalent in the boat world as it is in the second hand car market and property estate agents. Fortunately, we have experienced none of these worries and have actually been very impressed with both the level of honesty and helpful support that has been shown by your company. Good luck with your stand at Crick this year and we hope very much to make an appearance there ourselves to wish you well in person. Please call us on 01327 342211 or complete the form below and we will call you to discuss further.